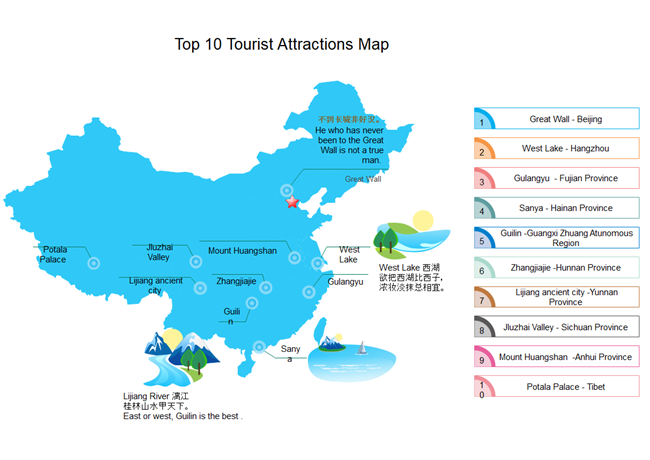 A vector map showing the top 10 places of interests in China visually. Use an easy and simple tool to draw more infographic maps to introduce places. China is a wonderland for many tourists. 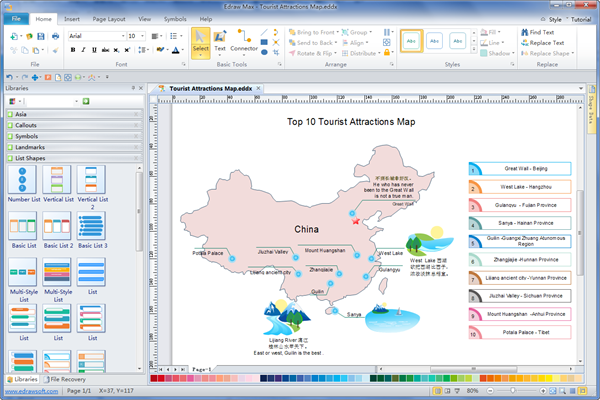 If you are keen on travelling, this map may help you plan a China tour greatly. To name a few, Jiuzhaigou in west China's Sichuan Province is famous for its multicolored lakes and fall foliage; Zhangjiajie National Forest Park is well-known for its grotesque rock pillars. If you are looking for world-class scenery, consider going to all of them. Below is a brief introduction to some of the famous destinations. The great Wall is so famous that many Chinese people believe that, " He who has never been to Great Wall is not a true man." (不到长城非好汉) In the eyes of most travelers, you haven't been to China if you haven't climbed the Great Wall. The West Lake in Hangzhou has been praised by many ancient poets. For example one famous poet Sushi said that "The West Lake looks like the fair lady at her best. Whether she is richly adorned or plainly dressed." (欲把西湖比西子,浓妆淡抹总相宜) Hangzhou is renowned as China's "Paradise on Earth". This island is like the cradle of music which gives birth to many musical talents. Its piano owning density is top 1 in China. Therefore it is also praised as Island of Piano. "East or west, Guilin is the best" （桂林山水甲天下） is the best reflection of Guilin's impressive landscape. Generations of Chinese painters and poets have been inspired by the beauty of nature there, using their pens and brushes to capture the breath-taking natural scenery. For example, the line from Hanyu, "The river is like silk ribbon and mountains are like jade hairpins." (江作青罗带,山如碧玉簪) The Li River was listed as one of the "World's Top Ten Watery Wonders" by America's National Geographic Magazine. Want to draw more vector maps? You can do it even without any drawing skill. With Edraw, you can gain professional-looking maps by just dragging and dropping shapes. Only a few minutes are reauired. Try it now. It is free for 30 days.